Now bath time can become a reality with Rub-A-Dub-Dub Baby Doll. Sculpted by award-winning doll artist Linda Murray, this adorable So Truly Real bath time baby doll is the first-ever Ashton-Drake Galleries doll with RealTouch vinyl skin that is washable! This huggable sweetheart also has soft strands of hand-rooted hair that you can actually shampoo! This Rub-A-Dub-Dub baby doll is 16 inches long and fully poseable. She comes to you clad only in a diaper but wrapped in a yellow, hooded ducky bath towel that features black eyes, a bright orange beak, feet and tail. Her bright blue eyes and wispy eyelashes bring her face to life and her soft RealTouch vinyl skin feels incredibly authentic. She comes with a shampoo bottle and her very own pink hair brush. A Lovely Gift is Lauren is a realistic reborn preemie baby doll sculpted in Real Touch silicone-vinyl by Tinneke. 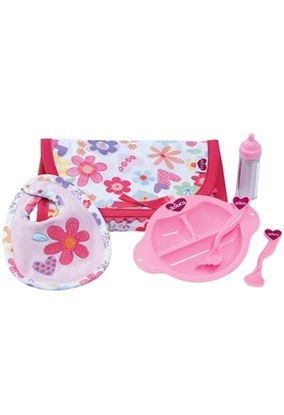 This feeding set has everything the little mommy needs to feed her hungry baby.